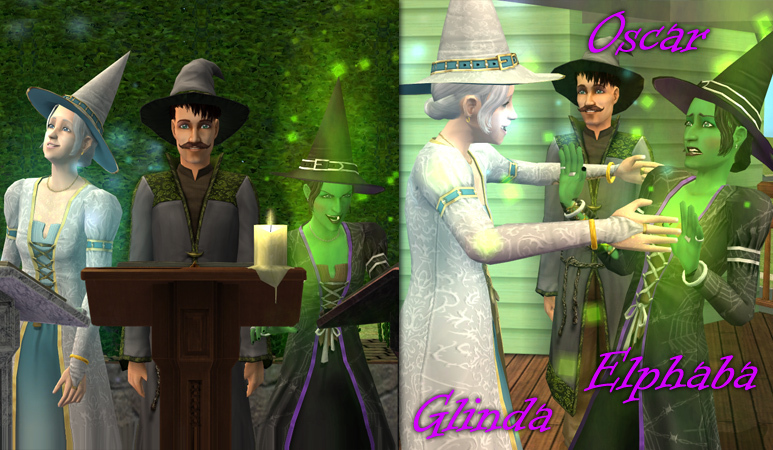 Mod The Sims - -SciFi Starter Families- Get the Paranormals HERE! by Phaenoh Posted 29th Feb 2008 at 12:46 AM - Updated 15th Sep 2013 at 8:59 PM by Phaenoh : My creations are ready! Conquer the world my beauties! A few days before the deadline, again. I’m sensing a pattern in my work… This was actually Plan D for this contest. Plan A was a Mad Scientist’s Death Ray, but the BHAVs were too complicated for me. Plan B was more clothes for Servos, but my I ended up losing my entire Pleasantview during that process (don’t worry, I found a really recent backup, nothing lost). Plan C was sim versions of SciFi movies, but I couldn’t get any AVI edit programs to work well enough for me. This one had some issues in moderation que, but I’m glad this one finally worked. I really hated my Plan E.
My entry is a set of starter families each one with a different one of our supernatural sims. I’ve been playing since forever and I’ve still never had some of these different types through the course of my normal gameplay, my idea is that some of you are in the same boat. 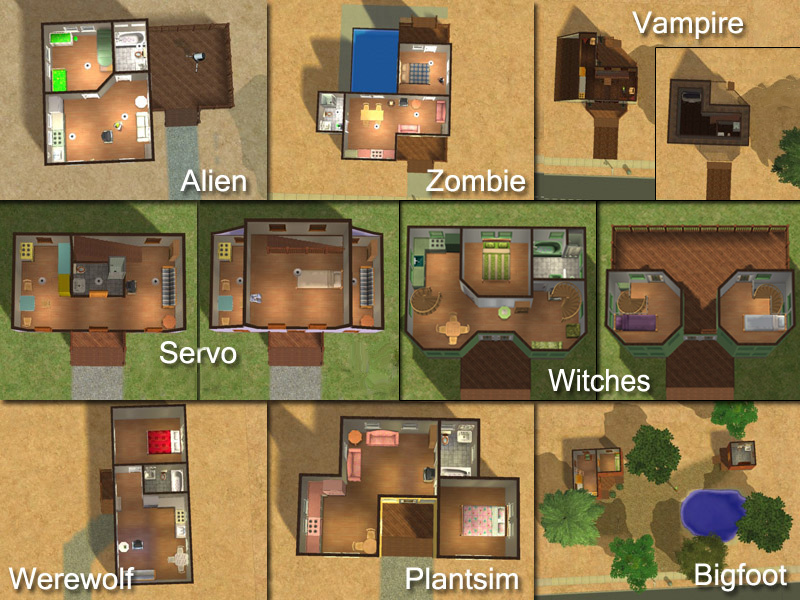 Each family is set on a 2x3 lot with a rather basic starter home. My entry is NOT supposed to focus on the houses, but so you know what you are getting, here are links to the pics (also below) Front Views, Floor Plans. The reason for uploading these sims in lots is because certain sim supernatural abilities are only available through gameplay. Each lot has been played for a minimum amount of time to acquire their supernatural traits. They have also been closely monitored so that they never met any other sims and have only memories pertaining to gaining their new traits. The procedure for safely moving sims (the hard way) found here was strictly adhered too. This 'should' make them safe for your game. (Being careless about it is why MTS2 doesn't allow these types of uploads normally.) A copy of each family has been tested in both another copy of the game configuration that they were created in and my full, all EPs and SPs, played version of Strangetown. In all fairness though, I need to warn you that these families don't have a 100% chance of being safe. From what I know about how I created them and all the posts I've read about the correct procedure and why you shouldn't do this in the first place, I'd rate them between 90% and 95%. (Moving sims within lots is NEVER 100% safe). If you need a neighborhood for them, I recommend this one I made almost especially for them. Scary stuff aside, I’ve made up cute little stories for each family and I love each of the names I’ve given each sim, there is a reason (or a bad pun) behind each. Bonus points to whoever figures out why I’ve chosen the names Elliot, Brian, and Pris. Don’t think too hard about the vampire’s name. 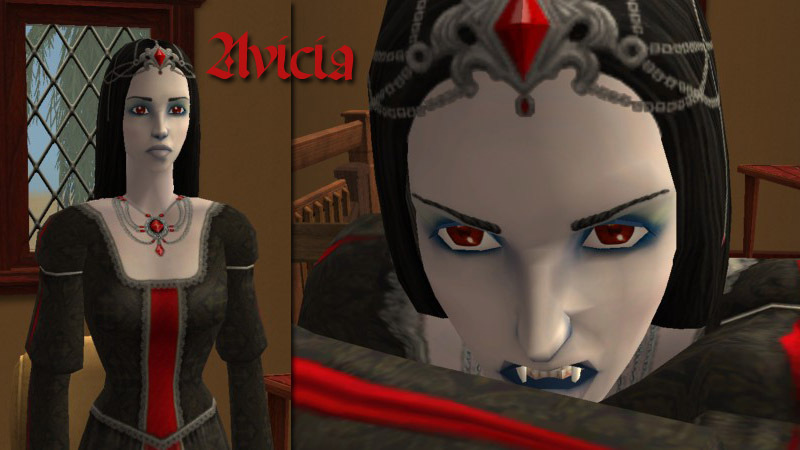 She is a vamp version of my self sim and I go by the name Avicia in different circles. All the others are just bad puns. The text below is the same as what you will read in game in the lot description, so don’t worry about trying to remember everything here if you want to follow my story starts. Each family is trying to learn how to live among ‘normals’ so their houses are pretty tame (much in the same style as my Katrina Cottages) but they are still individually suited to their owner. Each family also has a custom thumbnail in the lot catalog so you can identify it quickly (look for the images that are in the animated picture). Also, everything in this post is COMPLETELY CC FREE! 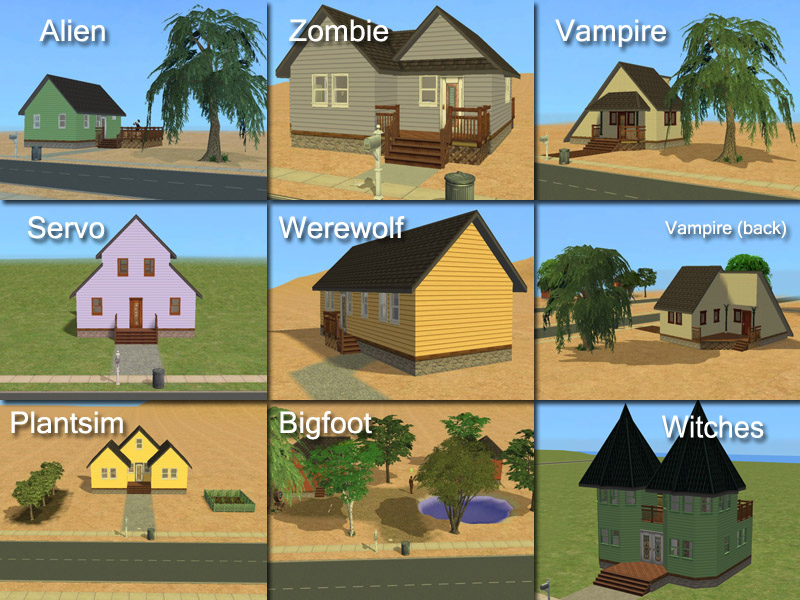 Simple houses didn’t need anything special and I only used Maxis makeup to make my sims look less ugly. I also understand that they still do look kinda ‘ugly’ by the beauty standards here, but I don’t want beauty queens in my game, I like the cartoony Maxis look that they have. (No one is ugly, I have standards too!) I created an entire Neighborhood for them to live in, go check it out! 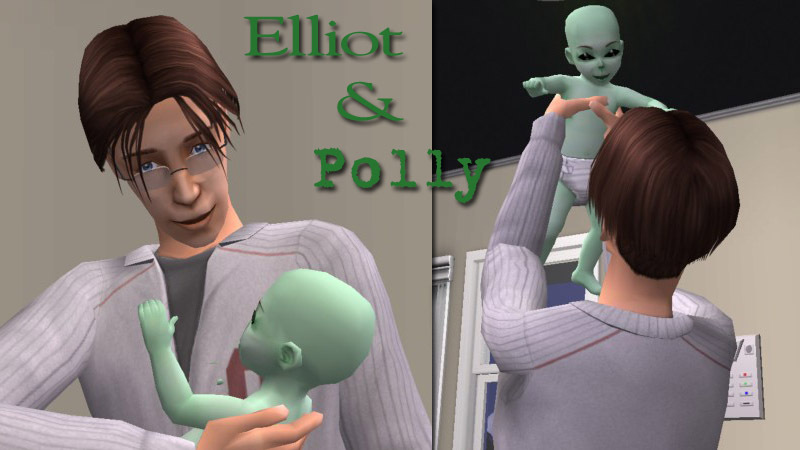 Elliot was abducted by aliens and just gave birth to baby girl, Polly. Their old town was a little less than accepting of his daughter's green skin. Can you help them fit in better in another town? Update: If you want to see how Elliot and Polly are doing in my game, he married Marigold and I used them for my scrapbook contest. Avicia loves the nightlife, raves are her all time favorite, aside from finding an unsuspecting victim of course... See if you can't help her fit in. Miss Marigold loves to garden. She would also love to raise a daughter, can she fufill both her dreams? Update: If you want to see how Marigold is doing in my game, she married Elliot and I used them for my scrapbook contest. This little family of witches is rather conflicted. Glinda and her grandaughter Elphaba see things a little differently, while Oscar, Glinda's son and Elphaba's father walks a fine line between them. Will the family come together or drift farther apart? My First Time: Having a zombie, servo, werewolf, and playable bigfoot. Previous Knowledge: boolprop testingcheatsenabled true, and some limited success with editing memories. Compatibility: Each family was made with a different setup of Numenor’s AnyGameStarter. This means, if you want Avicia, my vampire and you have Nightlife but not any of the other expansion packs, you can have her. If I had made them all in the same game you would need all the EPs to install any of these families. That means you would get to play none of my families if you didn’t have all EPs, sad! Thank you Numenor for this powerful tool! 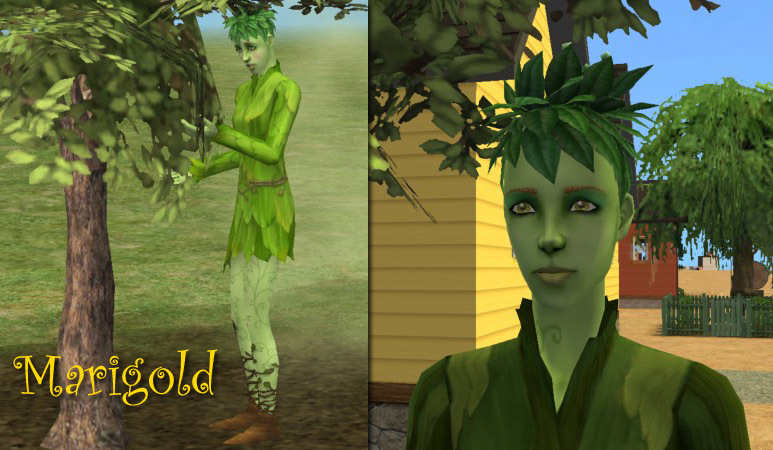 Nitty-gritty: Please don't reupload my sims, its silly in this case, but still bad karma! 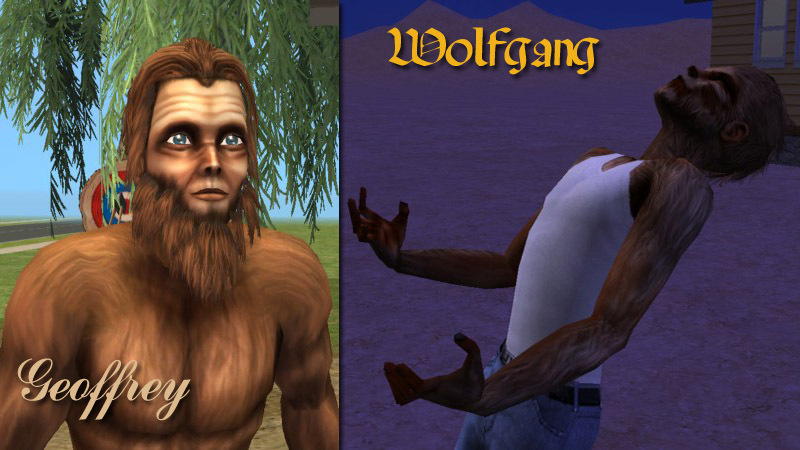 I'd also really appreciate it if you don't reupload my lots without the sims in them, even though they are not the focus of this post, they are still my creations and deserve respect. For those of you who like the houses but don't want the sims, download and install with CleanInstaller, you can yank the sims out of the house that way. P.S. Leave note? I'll be interested in seeing which one gets downloaded most, is it because the supernatural is harder to get, or because some EPs are more popular? MTS2 staff for letting this submission in and because I don't thank them often enough for all the wonderful things they do for us. "We Are Not Amused!" Queen Victoria!